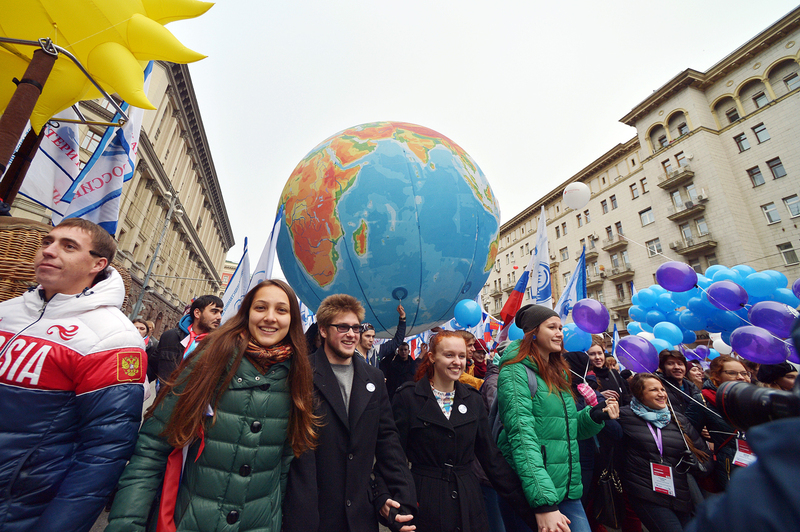 Participants of the 'We Are United' march and rally in Moscow on National Unity Day. "People have come at their own expense. It is important for them to say that although there are many confessions and different points of views, there are dates and moments when we should unite" - the secretary of the Civic Chamber. Nearly 80,000 people are taking part in the "We are united!" march in downtown Moscow on occasion of the National Unity Day, the city police told TASS on Nov. 4. "The march on Tverskaya Street started from the Mayakovskaya metro station, and some 80,000 people are participating in it," the Interior Ministry’s press center said. "The demonstration drew members of the Civic Chamber and many representatives of the regions," said Alexander Brechalov, who is the secretary of the Civic Chamber. "People have come at their own expense. It is important for them to say that although there are many confessions and different points of views, there are dates and moments when we should unite," he stressed. Brechalov also said the monument to Prince Vladimir that will be unveiled in the center of Moscow on Friday, signals "the return of history." Prince Vladimir brought Eastern Orthodox Christianity to Kievan Rus in 988. The erection of the monument is important both for Orthodox Christians and representatives of other confessions, he said.